Dominic Beckingham’s wife died when her son was quite young, but prior to that she did her best to remind him of his heritage. James “Fox” Beckingham was descended from a long line of Lord Beckinghams, but a recent ancestor had sold the family castle and now Fox and his father lived in Australia. The family emblem was a peacock, and Fox had made himself a tee-shirt with a punning emblem. His distant cousin Cat Mahal didn’t like it so Fox decided to set her straight about peacocks, pies and bad-taste tees. Now he smiled, reminiscently, and I almost liked him. He was fond of his mum. Awww. He was not afraid to show it. Respect. 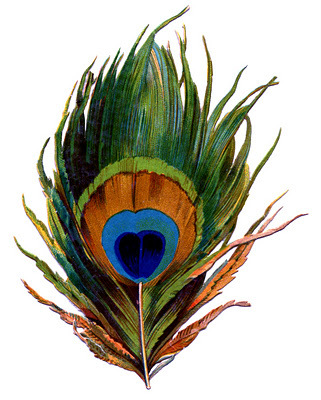 The last peacock-related gift (and indeed the last gift of any kind) that Mrs Beckingham gave her son was a copy of Walter de la Mare’s Peacock Pie. That was the last mention of Mrs Beckingham’s peacock feathers, and her widower and son had moved at least once since her death. Did they take the feathers with them? It’s likely they agreed not to, and then did so anyway.